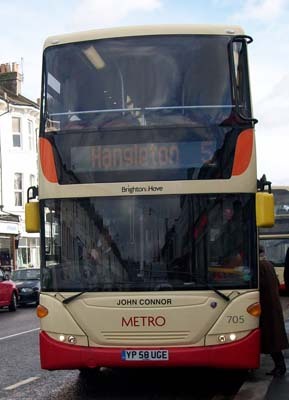 Connections with Brighton and Hove : One of the best known journalists in Brighton in the post war era, John Connor became editor of the Brighton and Hove Herald in 1963. Born in London, he moved to Brighton and Hove, starting work on the Herald in 1941. He had an immaculate shorthand note and developed excellent police contacts. He covered all the major news stories in the area, ranging from the police conspiracy trial to the murder of seven year old Maria Colwell by her stepfather. The inquiry into her death led to changes in the law. Connor could turn his hand to any kind of writing. Once in successive days, he covered an Albion football match and a play at the Theatre Royal. He only left the Herald, which had been founded in 1806, months before its demise in 1971. The he bought the local news agency which still operates under his name. Connor’s work was his life and, appropriately, he died in harness. He left a widow and a son. With his trademark blue suit and large Jaguar car, Connor was an easily identifiable figure. 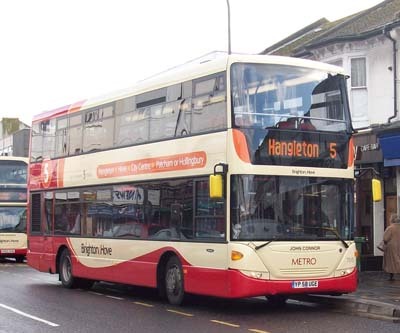 When not working which was seldom, he led a sedate life at his home in Hangleton. His eye for a news story was legendary. His memory was remarkable and his devotion to accuracy scrupulous. He loved newspapers and knew instinctively what made them tick. 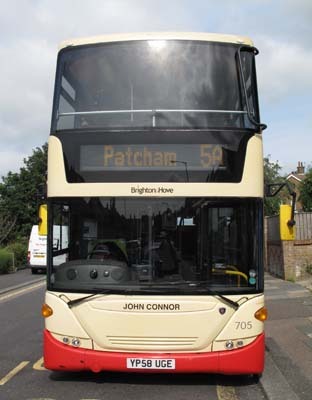 705 Scania Omnicity - carried name since delivery in December 2008. Metro 5 branding removed June 2013. 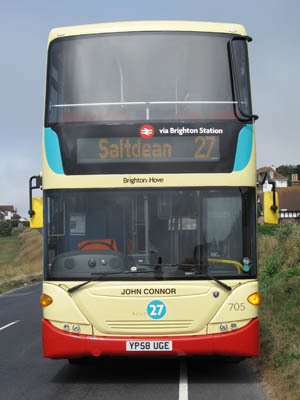 Repainted into Route 27 livery July 2013. 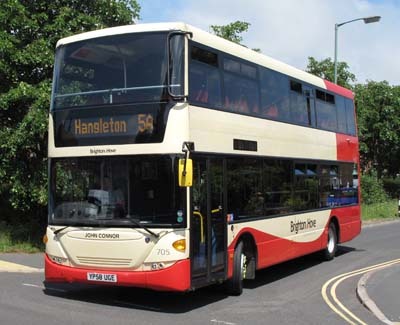 Bus sold in March 2018.